As hatred is defined as intense dislike, what is wrong with inciting intense dislike of a religion, if the activities or teachings of that religion are so outrageous, irrational or abusive of human rights that they deserve to be intensely disliked? 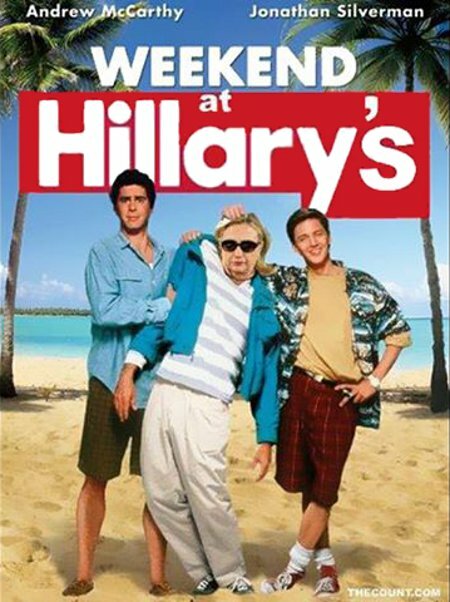 I don’t know if it’s funny, scary, or equal parts of both, but a dead Hillary “serving” as POTUS isn’t as fantastic a premise as the 1989 comedy film, Weekend at Bernie’s. Really, going back to the late 19th century, Presidents have been hiding the medical conditions from the public. With body and voice doubles, animatronics, and modern CGI, it’s hardly implausible that the White House’s and DNC’s inner cabal couldn’t trick America into thinking that a dead Hillary was alive and well. 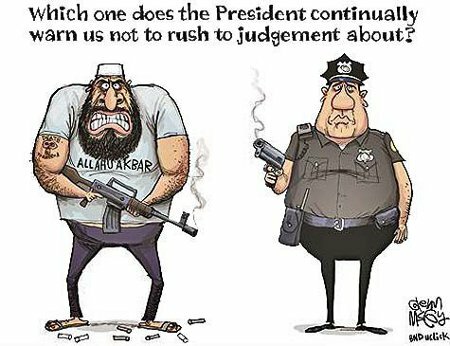 It’s important and quite telling that Obama constantly demands that Americans not rush to judgement when a Muslim commits and act of violence upon American soil but constantly rushes to judgement and condemnation every time a police officer kills a Black. It tells the world at large just exactly where- and who and with both his sympathies and antipathies lie. This behind the scene picture from the recent Trump vs. Hillary debate at Hofstra University shows us that, irrespective of which candidate any individual thinks won the debate, our society as reflected by university students and faculty is an undebatable failure. Oh, and to make things worse and an even greater failure, this warning sign was apparently not put up because of any specific content. 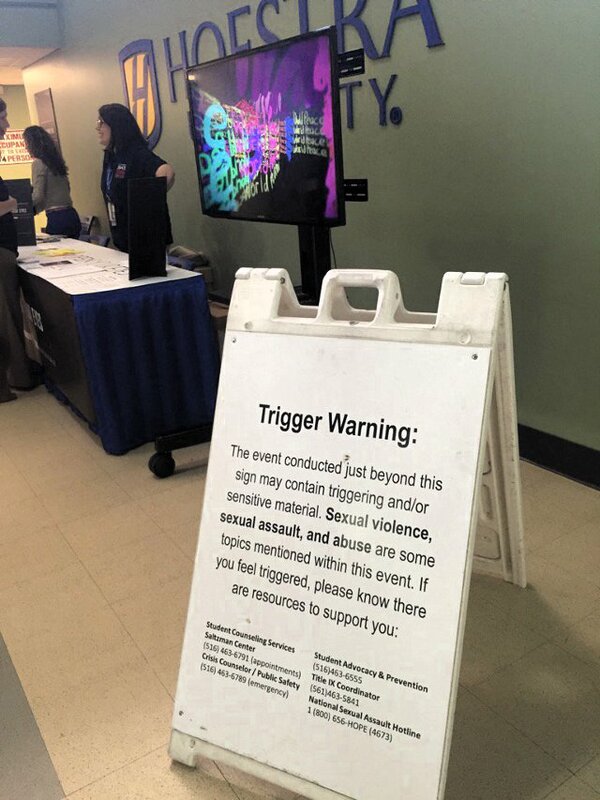 The Student Union apparently provides such warnings to the “special snowflakes” whenever an uncomfortable topic might be brought up during an event. Of course, since Trump is man and Hillary a female and they would be in conflict, by the current standards in America’s colleges there was the guarantee of some sort of assault or abuse. Trump was, after all, not going to agree with her and that would be a trigger. Oh wait! I’m an American White Man. By writing “trigger” I probably triggered one or more of the “special” people because it inherently referenced firearms and White Male Violence. There is no denying that these young with their constant offense and equally constant venality and greed are failures at life and failures as the children of Man. So too, however, and to a greater shame are their “parents” who failed to raise them, much less raise them right. 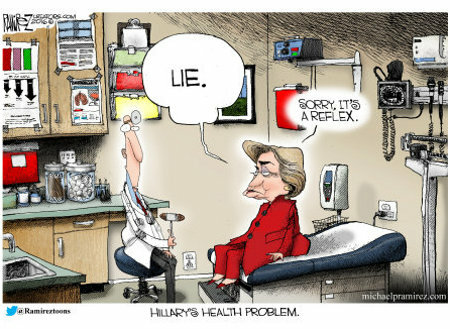 Consider that Hillary’s health problem isn’t physical or mental in nature. Consider that her real health issue is moral. Much like Obama, lying is her default reaction to being questioned or required to speak in any manner. That Iconic outfit. Who wore it best – North Korea’s Kim Jong-un, Fiction’s Dr. Evil, or Hillary Clinton? Now normally I wouldn’t bother posting this even as a joke. Fashion sense is hardly a decent metric for determining a person’s qualification for political office. However, just like all political candidates, Hillary’s wardrobe is part of her marketing and is made up of deliberate choices intended to identify and iconify her brand. Hence, her trend to choose variations of this particular outfit does have some significance and does raise some serious questions about her and her followers. Again, whatever Clinton wears is a deliberate, controlled choice meant to project the image she and her campaign think will resonate with her likely voters. 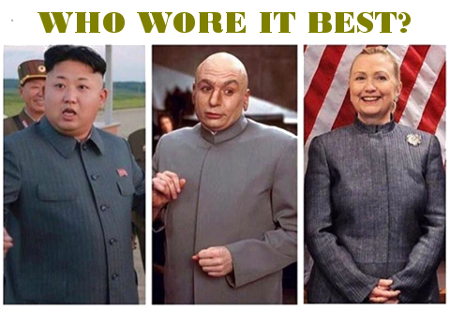 What does it say that she chooses an outfit most associated with dictators and would-be dictators?